How is the gold price made? When we hear commentary on why the gold price has moved, we usually hear of U.S. economic or political factors and a move in the U.S. Dollar. Most times these do not precipitate the buying of physical gold. What they do do, is to spur the buying or selling of futures or Options on the COMEX gold market. Many commentators attribute moves in the physical gold price to moves on COMEX. But this link is tenuous, as COMEX does not [except for a maximum of 5% and minimum of 1% of contracts that disclose they will deal in physical gold, upfront] deal in physical gold. The dollar gold price is the one that most investors look at, even though they may deal in a different currency to the dollar. This is because the dollar is the key global currency against which all others are measured. U.S. gold prices today are primarily driven by demand for physical gold in gold ETFs, such as the Gold Trust and the SPDR gold ETF [GLD]. But the bulk of physical gold traded in the world now happens on the Shanghai gold exchange. There are 10 million investors, including 10,000 institutions that are able to deal over their cell phones at any time on the Shanghai Gold Exchange. Such a market dwarfs both London and New York on the physical front, as all transactions have to be backed by physical gold. With gold exports not permitted from China, there are obstacles to the free flow of gold globally. The International Gold Exchange in Shanghai has not yet attracted sufficient numbers to allow this. But the major banks can and do hold stock both in Shanghai and London and by running a dollar/Yuan currency book can arbitrage gold between the markets to smooth out the bulk of price differences between markets. While there are frequent fingers pointing to the ‘premium’ of Shanghai prices over those of London and New York of $5 all the time, it is because Shanghai prices 0.9999 quality gold whereas London prices 0.995 quality gold. One has to deduct this before comparing the prices in the two markets. On top of this we see between $5 – $15 an ounce difference on a daily basis, which can include the cost of moving the gold from London to Shanghai. Overlying this cost lies the difference in liquidity between the markets and the differences in local demand and supply. In the very liquid Shanghai market, bullion banks do not exert the same influence as in London and New York, so speculation is restricted. It is further restricted by the much higher costs of taking large speculative positions in Shanghai. These costs were increased at the beginning of the year to discourage speculation. Shanghai, as a result, gives less volatile prices, more indicative of [Chinese] physical demand. While no gold flows out of China [removing its downside pressure on the gold price] Chinese demand draws from the rest of the world. Gold enters China from the rest of the world’s gold markets primarily via Switzerland where it is refined into metric bars. We see metric measures of gold dominating the global gold market in the future. Imports comes from all over the world in all forms, with a reducing amount coming in via Hong Kong. Consequently, the Shanghai Gold Exchange gold price, although higher [for reasons given above] is exerting a growing influence on the global gold price in all currencies and better reflects the physical gold price of gold. With London having been the global center of the physical gold world until recently, one would have thought that the influence over the gold price would have resided in London. But this is no longer so, as history over the last few years, has shown that London has usually followed COMEX prices. Of course, this would give rise to charges of ‘manipulation’ from U.S. and other sources. The not uncommon bear-raids by the big U.S. banks and high frequency traders ensured that the gold price bore little resemblance to the real global physical gold demand and supply factors. But on closer examination of the chart above, one sees that all but a small percentage of “gold” is traded not in gold but in some form of derivatives, such as shares in GLD, futures, options, or even gold shares, where the buyer does not own physical gold but a piece of paper to the gold price. Take out this ‘paper’ gold and London and New York’s 88% of gold traded, falls to around less than 1% compared to Shanghai’s 5% of physically traded gold. i.e. five times as big. When there is a real premium in Chinese gold prices over London and New York’s Chinese gold importers [Like the ICBC/Standard bank and HSBC bank] then export gold bullion to China to meet that higher demand and smooth out price differentials. Consequently, we have witnessed a steady very, very large flow of gold pass through the refineries of Switzerland [to be upgraded to 0.999 fineness] and onto the Far East. This has allowed both Russia and China in particular, to acquire huge tonnages of gold [on top of their own production] at what really are, discount prices over the last decade! With gold now an integral part of the Chinese financial and banking systems, China cannot afford to be at the mercy of the capricious, non-representative, U.S., physically-small gold market, even though the volumes of paper gold traded are huge as you can see in the pie chart above. Day to day news items are not the real reasons gold is bought and sold in the west. It is theprofit motive inherent in western financial markets, driving traders and funds to buy and sell gold frequently. Gold holdings are changed even by large funds from day-today positions to monthly or three monthly. There are few that hold a long-term holding. The demand for short-term performance prevents that. The motive east of Greece is to acquire gold holdings as a prime financial asset that, over time, provides secure wealth for the long term. Trading of gold is an ancillary function only. East of Greece it is the sheer volume of gold kilos held that’s important. China’s gold holdings are far greater than the available statistics tell us. Gold is held as jewelry at retails levels, on the balance sheet of banks, in the Shanghai Gold Exchange, for clients, as well as for the Exchange itself, in government agencies, for the government and by the People’s Bank of China, for the nation. This is resulting in China moving to take over gold’s global pricing power. Because that is where prices are set. The mint certificates, the ETFs, and the coins in an investor’s safe – all of them – are valued, at least in large part, based on the most recent trade in the nearest delivery month on a futures exchange such as the COMEX. These “spot” prices are the ones scrolling across the bottom of your CNBC screen. Not so in a futures market such as the COMEX. If an investor buys contracts for gold, they won’t be paired with anyone delivering the actual gold. They are paired with someone who wants to sell contracts, regardless of whether he has any physical gold. These paper contracts are tethered to physical gold in a bullion bank’s vault by the thinnest of threads. 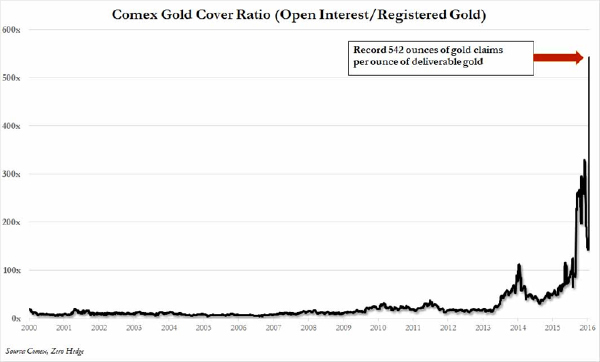 Recently the coverage ratio – the number of ounces represented on paper contracts relative to the actual stock of registered gold bars – rose above 500 to 1. The party selling that paper might be another trader with an existing contract. Or, as has been happening more of late, it might be the bullion bank itself. They might just print up a brand new contract for you. Yes, they can actually do that! And as many as they like. All without putting a single additional ounce of actual metal aside to deliver. Gold and silver are considered precious metals because they are scarce and beautiful. But those features are barely a factor in setting the COMEX “spot” price. 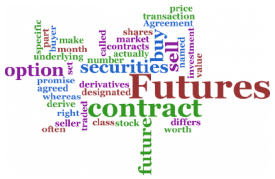 In that market, and other futures exchanges, derivatives are traded instead. They neither glisten nor shine and their supply is virtually unlimited. Quite simply, that’s a problem. But it gets worse. As said above, if you bet on the price of gold by either buying or selling a futures contract, the bookie might just be a bullion banker. He’s now betting against you with an institutional advantage; he completely controls the supply of your contract. It’s remarkable so many traders are still willing to gamble despite all of the recent evidence that the fix is in. Open interest in silver futures just hit a new all-time record, and gold is not far behind. This despite a barrage of news about bankers rigging markets and cheating clients. Someday we’ll have more honest price discovery in metals. It will happen when people figure out the game and either abandon the rigged casino altogether or insist on limited and reasonable coverage ratios. The new Shanghai Gold Exchange which deals in the physical metal itself may be a step in that direction. In the meantime, stick with physical bullion and understand “spot” prices for what they are. Speaking yesterday at Mines & Money London among one of the best speaker programmes at any conference I’ve attended recently, perhaps the stand-out presentation was from John Hathaway, Senior Portfolio Manager for Tocqueville Asset Management of the U.S. – and when I say it was the standout that was praise indeed given the remarkable array of top speakers presenting on the day. Perhaps the only real problem is that with 20 minute speaker slots, kept to remarkably rigorously by the organisers, many of the speakers could have gone on far longer. But the organisers have to be commended for bringing so many top names to a London conference. Going through the speaker slate for the day we had Rick Rule, Frank Holmes, David Humphreys, Pierre Lassonde, Evy Hambro, Mark Bristow, Peter Hambro, Oskar Lewnowski, John Kaiser, Graham Tuckwell, Rob McEwen, Grant Williams and many more, as well as some cracking panel discussions featuring most of the above, and others. Today’s programme is almost equally strong. Mines & Money’s format seems to be working well and as well as events in Hong Kong and Australia the conference company is planning a North American event next year too, to be held in Toronto in September. But back to John Hathaway – there’s a more comprehensive article on his presentation written by me on the Sharps Pixley website – click here to read it – but for the record here he climbed into paper gold on COMEX and its undue effects on the gold price, in the light of the huge amount of paper being traded – latest figures suggest that paper gold trades in a single day can reach as much as 300 times daily global physical gold supply. Overall this has the effect of the gold price being set based on U.S. paper trades, almost totally ignoring supply/demand fundamentals – which are far more positive for gold, particularly now the big liquidations out of the gold ETFs are diminishing drastically, and in view of the record gold demand coming out of China and India, which between them are on their own accounting for around all globally new mined gold. Hathaway also looked at a number of other aspects on gold supply and demand, and like a number of the other gold oriented speakers is convinced that the fundamentals for gold are so positive that the price must turn positive sooner rather than later, but the actual timescale remains obscure. New York closed with the gold price at $$1,137.30 up from $1,114.30 on Friday. China remains closed until Thursday in its ‘Golden Week’ holiday. When London opened the gold price slipped to $1,135.00 after which it was set at $1,134.35 up from Friday’s $1,106.30 at the LBMA gold setting. The dollar Index was down at 95.58 from 96.30 and the dollar trading against the euro at $1.1268 down from $1.1165. In the euro the fixing was €1,006.70 up from €990.86. Ahead of New York’s opening gold was trading at $1,133.00 and in the euro at €1,107.60. The silver price closed at $15.24 up from $14.56 or 68 cents over Friday in New York. Ahead of New York’s opening, silver was trading at $15.31. After the jobs report the dollar immediately fell two cents against the euro although the gold price in the euro also rose €20 at the same time. With little gold actually traded we see just how large the influence of COMEX and dealers in gold is in the market place where demand and supply are almost ignored. The same is true in the silver market. As we have pointed out in our newsletter before, it will take the arrival of the Shanghai gold price setting to change the pricing of gold. With a Chinese physical price and a New York ‘COMEX’ price moving away from each other, arbitrageurs will trade between the two smoothing out price differential. This will cause a structural change in the gold price. The ‘Yuan Gold Fix” is scheduled to begin before the end of the year. With China still closed, we did expect attempts to crush the gold price through small physical selling, but the jobs report appears to have put paid to that now. The Technical picture is now moving to a critical point which may see a strong move this week. next two or three months. Deleveraging will slow and the threat of more turmoil remains when interest rates eventually do rise. Silver is rose a remarkable 68 cents on little trade in the Silver Trust, as dealers whipped prices higher to protect themselves. Julian Phillips’ latest commentary on early day movements in the gold and silver markets and some of the forces he sees as currently driving prices. New York closed at $1,189.70 on Monday, up $1.20 on the Friday close as the trading range remains tight. Today sees the dollar stronger at $1.0898 against Friday’s $1.0949 against the euro with the dollar index at 97.48. The LBMA Gold Price was set at $1,188.75 up $1.45 and the equivalent euro price was €1,082.75. Once again this was a currency play against a weaker dollar and stronger euro. Ahead of New York’s opening, gold was trading in London at $1,188.60 and in the euro at €1,078.10 with the euro recovering. The silver price rose slightly to $16.73 up 3 cents in New York. Ahead of New York’s opening it was trading at $16.68. Yesterday saw sales from the SPDR Gold ETF of 1.79 tonnes and nothing from or into the Gold Trust. The holdings of the SPDR gold ETF are at 714.067 tonnes and at 166.60 tonnes in the Gold Trust. We do not believe these sales had an impact on the gold price. What was notable yesterday was that the price of gold leapt through $1,200 at the start of business in New York on heavy volume. The buying out of Asia was heavy. While the gold price sank back to $1,189 thereafter, we are of the opinion that such bursts of buying remove large chunks of liquidity from the developed world’s gold markets. Such a process brings heightened volatility in a shrinking market. Having said that, it will take some time before we see COMEX losing its pricing power but it is on the path to losing it, we believe. With gold prices pulling back again, we see Asian demand coming in again as it will continue to do below $1,200, again, fading when prices go through that level. In the U.S., data released yesterday was lacklustre at best. Inflation, consumer spending disappointed coming in well below expectations and well below what the Fed wants. The numbers for the second quarter of the year have become critical in deciding the direction of the U.S. economy and, by extension the Eurozone and Japanese economy. China is also weakening more than the Chinese government wishes, but they still have a lot of tools and far greater control over the Chinese economy that the developed world has over theirs. With such weakness around, an interest rate rise could have a disproportionate impact on the recovery. If the numbers for the second quarter are poor, at a time when the recovery should show itself at its best in the year, a major reappraisal of all markets will take place. The dollar is no longer giving signs that it is headed much higher. It is stalling at current levels. If it were to continue rising much more, it would hammer the U.S. export market and the recovery, as well as disrupt the global monetary system. Julian Phillips’ latest gold and silver market commentary. New York closed yesterday at $1,198.80 up $15 with Asia lifting it just over $1,200. The Fix saw the gold price set at $1,199.25 up $12.75 and in the euro, at €986.550 up €10.007 while the euro was barely changed at $1.2156. Ahead of New York’s opening today gold was trading in London at $1,197.80 and in the euro at €985.56. New York saw short positions closed yesterday with the gold price rising to $1,206 at one point, before settling back to consolidate at $1,200 once more. There were sales of 1.494 tonnes from the SPDR gold ETF but no change in the Gold Trust yesterday, but this did nothing to slow the recovery of the gold price over $1,200. The holdings of the SPDR gold ETF are at 710.808 and at 161.73 tonnes in the Gold Trust. We expect trading ranges to narrow today, the last day of 2014, as we move forward to the point where the gold and silver prices make strong moves into the New Year. What is of note is the strength of gold in the euro at €985. We expect 2015 to be the first of the next few years of consequences. We may well see a Fixing or similar established in Shanghai as that market matures and becomes the center of gold trading, overtaking but partnering with London in a 24-hour gold market. It will likely, also be a year when arbitrageurs between the two centers will smooth out the premiums between east and west giving us a global price all the time. Just a word on yesterday’s commentary, where we said that, “New York is losing its influence over the gold price.” While New York and London have highly developed markets where traders can move prices around very quickly and make them react in the short-term to most pieces of news, the physical demand for gold has risen to the point where marginal supplies of gold are also being absorbed by the east. This is making it difficult for traders to move physical gold in sufficient amounts to move prices. The physical amounts of gold available for trading the gold price have dropped dramatically in the last two years leaving physical demand from the east reaching in to take most of that stock as well. Consequently, just as oversupply in the oil market has crushed the influence of marginal supplies to dominate prices, so ‘over-demand’ is doing the same in the gold market. Some will retort that COMEX dominates gold prices due the huge volumes traded there. We again point out that COMEX trades paper and is essentially a financial market and only trades around 5% of its contracts in physical gold that will be delivered. COMEX traders need to trigger real physical sales or purchases to back up their ‘paper’ transactions to move gold prices. If there are no deliveries of gold on COMEX there can be no impact of COMEX on the gold price. 95%+ of gold contracts on COMEX are closed out before a physical delivery of gold happens. The silver price is as quick to recover as it is to fall.